Please note this is a special event, and we will not offer free admission to the Gardens during Whispers from the Past. This fall take a trip back in time to rediscover the culture and contributions of Native Alabamians at Whispers From the Past – A Native American Experience. Native American life will take shape through demonstrations of flintknapping, hunting weapons, pine needle basket weaving, stick ball, corn husk dolls, and dream catchers, along with activities like leaf pounding, bead weaving on looms, corn grinding, gourd painting, and pottery. Children can try their hands at games and activities. Hear the sounds of drums and flutes, and the highlight of the day - three dance performances by Native American Pow Wow dancers. 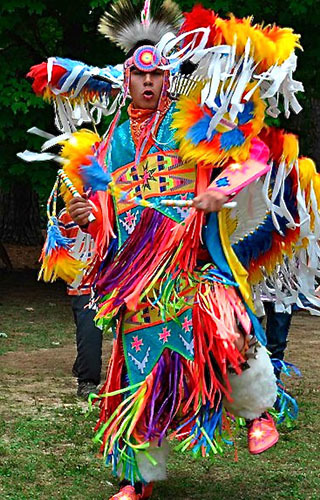 The Pow Wow demonstrations will last approximately 45 minutes and will take place at 11:30 a.m., 2:00 p.m., and 4:00 p.m. Authentic Native American food will be available for purchase as well as handmade flutes, artifacts, and more. Click here for much more on the day's events, vendors, and what visitors can expect at Whispers from the Past.